Toile is the name of a fabric that entered the English language around the 16th century from a French word meaning "linen cloth" or "canvas". 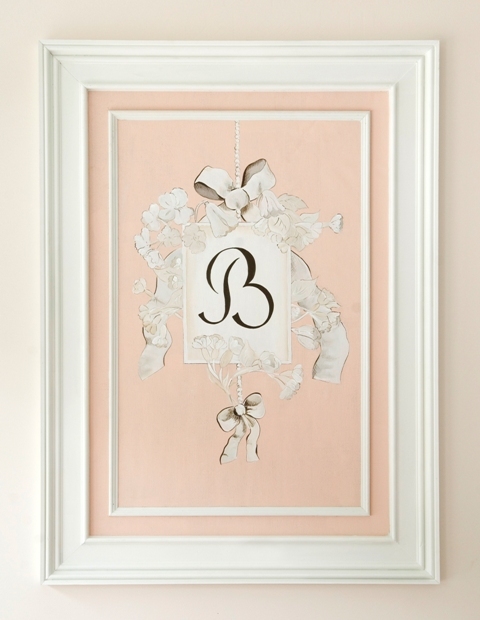 It is more illustrative looking than painterly; however, this classical style is a beautiful way to decorate a nursery boy or girl. Below these hand painted canvases were mounted to the wall then a frame was built around it. Notice the beautiful wooden scroll work that has actually become part of the painting. This mural can be taken down and stored with ease. It is a great way to pass this art work on to future generations, an heirloom.